The former Townhall was inaugurated in 1827. The ceremony was preceded by a mass when the priest blessed the building in the name of the Holy Ghost. 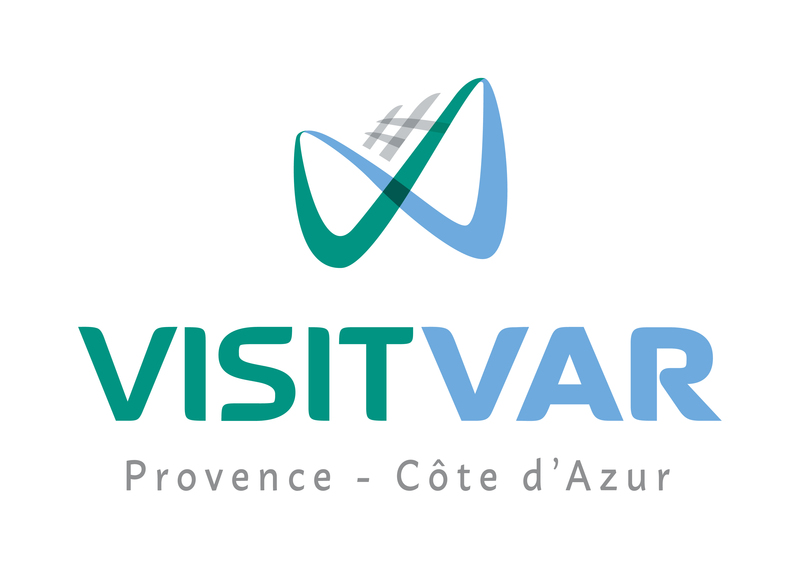 This Provencal tradition dating from the Middle Ages witnesses the role played by the religious brotherhood of the Holy Ghost in the character of the village communities. Until the beginning of the 19th century, all decisions made by the town councils also invoked the protection of the Holy Ghost. The ground floor of the building housed a classroom as well as the town jail or lock up. Its window can still see from rue Droite. The first floor housed the council chambers and records office. The old Town Hall and its surrounding narrow streets was the scene of a popular uprising in 1851. On 2nd December 1851, after news of the coup d’etat by the “President Prince”, the future Napoleon III, the people of the Maures villages took up arms and followed their republican duty to defend the Constitution. Here in La Garde-Freinet the inhabitants occupied the Town Hall and took the councillors hostage. 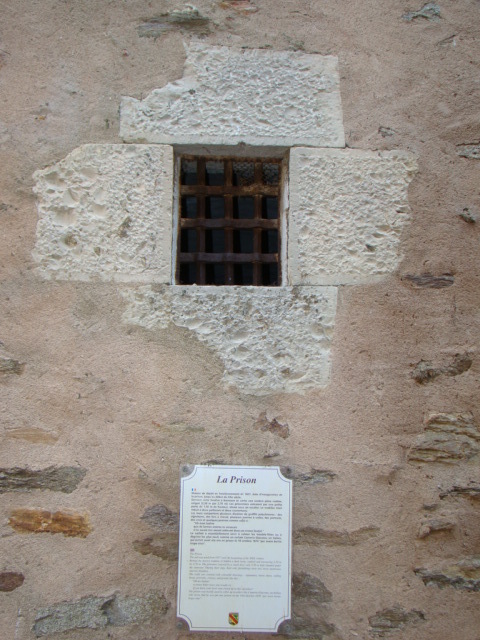 The jail was in use from 1827 until the beginning of the XXth century. Behind the barred window, is hidden a dark room, vaulted and measuring 2,50m by 2,70m. 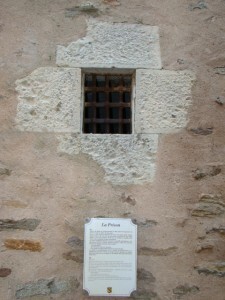 The prisoners entered by a small door only 1,50m high situated under the staircase. During their stay, their only furnishings were two straw mattresses and two blankets. The prison was mostly used to sober up revellers like Camerio Giacomo, an Italian who wrote that he was put into prison on the 18th October 1870 “per avere berito tropo vino”. The impressive new Town Hall of La Garde-Freinet was inaugurated in great pomp and ceremony in 1857. The building is decorated in serpentine, a green rock crystal, worked as dressed stone, This extravagance was symbolic of the newly thriving and prosperous town. The sale of chestnuts, the breeding of silkworms and above all the cork industry formed a solid economic foundation which tripled the population in the course of the 19th century. 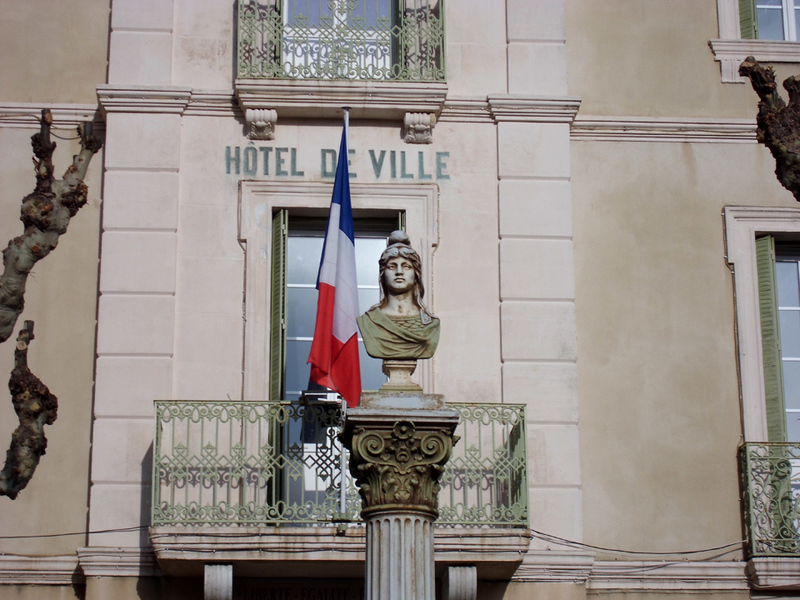 The Town Hall overlooks a large public square (which used to be the cemetery) and is close to the main road linking Le Luc and Grimaud, this new position solved the various problems of security that arose in the old Town Hall during the 1851 riots. As was usual, the building housed the schools for both girls and boys and accommodation for their respective teachers, as well as council chambers. In 1889, a memorial was erected in the square to commemorate the centenary of the French Revolution. As in many French towns, the emblem of this commemoration is a beautiful woman known as the “Marianne”.